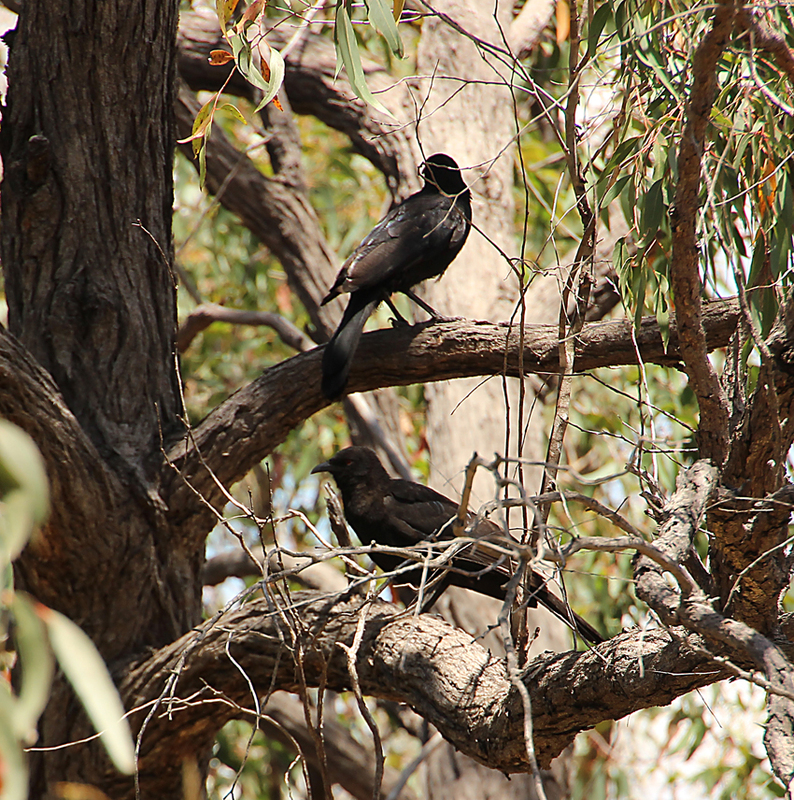 There are two white winged choughs in the eucalyptus tree about a hundred metres away. The birds are quite wary, flying deep into the woodland every time I approach. Choughs are often mistaken for crows but closer examination reveals a curved beak and rusty coloured eyes in these juveniles, red in adults, as well as white patches on the wings. The birds seem to be quite communal and there are at least a dozen scattered amongst the trees. 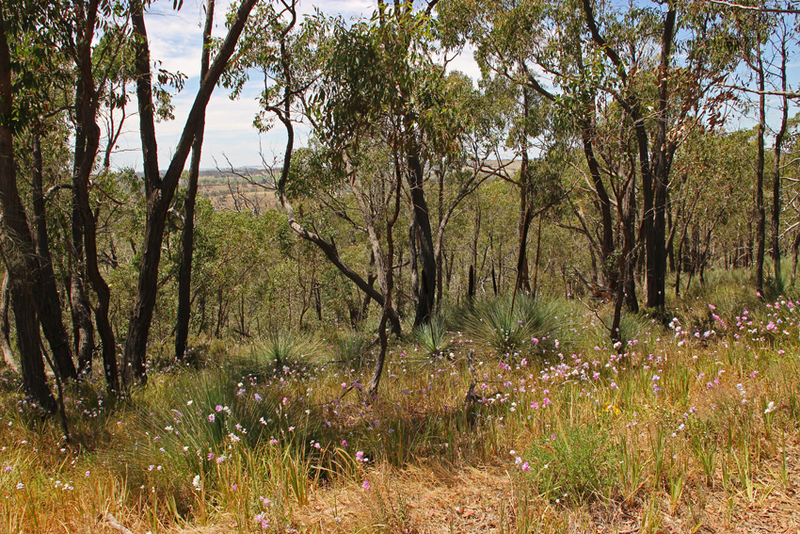 I am driving through the Spring Gully Conservation Park about five kilometres from the little hamlet of Sevenhills in the Clare Valley. Where the road to the park leaves the main highway we have ‘dined’ at a local bakery on coffee and one of the best vanilla slices ever to clog an artery. This crossroad also leads to the renowned Skillagolee restaurant and winery where we have booked an afternoon tea. Leaving the choughs to their socialising I park a little further along the road by a fire track then walk along a bush trail. The view of the plains beyond; with rare red stringy barks, as well as yacca or grass trees and bush lilies in the foreground, is breathtaking. There are numerous trails leading off the main track, one winds down to a creek and waterfall. However, the afternoon is drawing to close and we are simply doing a quick drive through in preparation for some bush walking later. Afternoon tea is superb, scones and a cheese platter, followed by a pleasant time tasting some of the excellent Clare Valley wines. 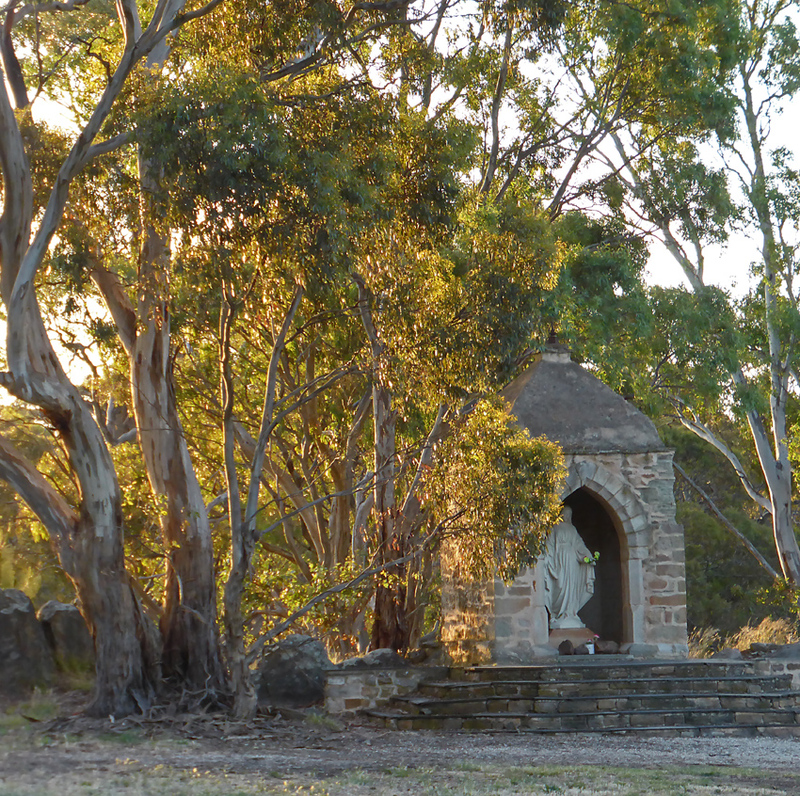 Now the sun is low in the sky and it is time to drive down to the Jesuit winery at Sevenhills where altar wine is produced amongst other table vintages. 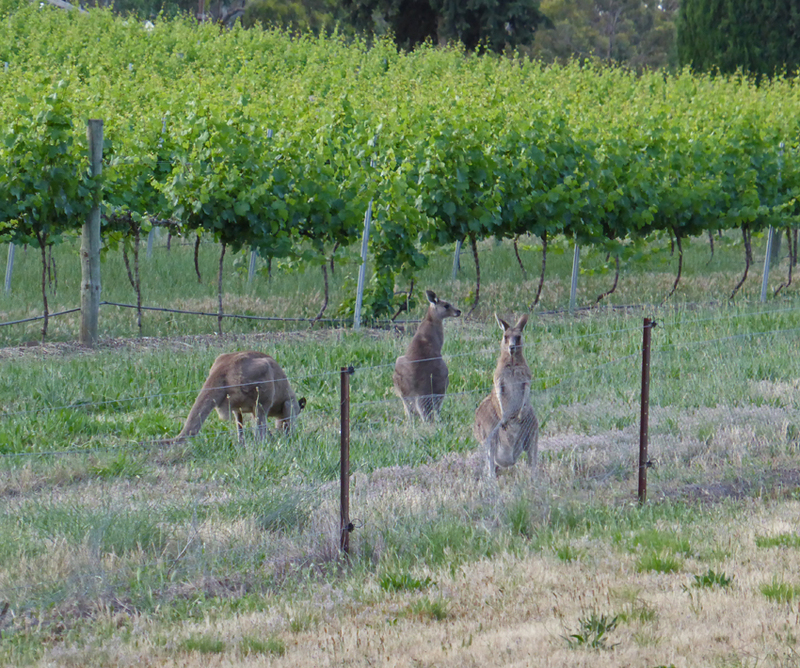 As we drive along the entrance road to the monastery and vineyard we are lucky enough to catch sight of a group of grey kangaroos feeding along the fence line by the vines. I have often seen roos here on previous trips and it is an image I was hoping to capture. With the evening sun backlighting the trees that surround a sacred grotto, kangaroos in a vineyard and a flight of pink and grey cockatoos settling in the trees to roost it is hard to imagine a more idyllic way to start our weekend trip through the Clare Valley. 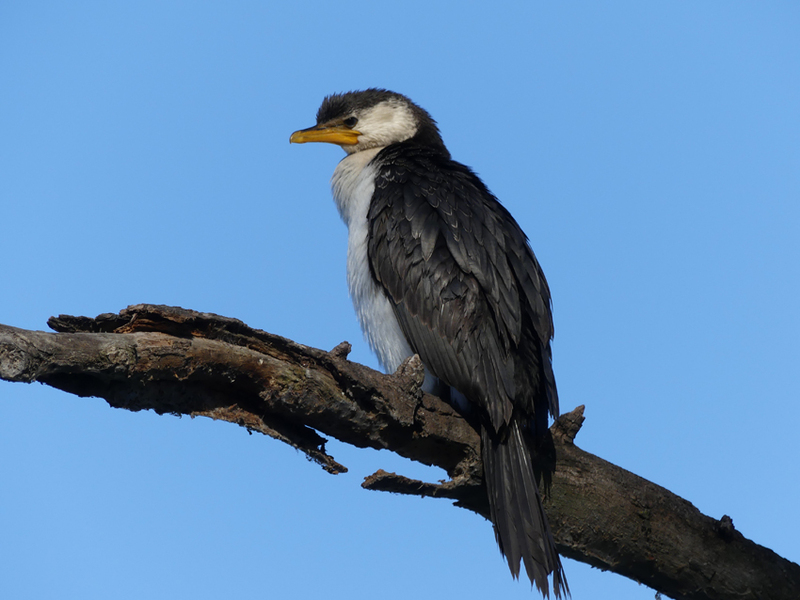 The ‘little pied cormorant’ is perched precariously on a branch overlooking the lake. It has been fishing for the last ten minutes and I have watched the bird continually diving under the water to pursue small fish before swallowing them when it surfaces. When the cormorant has finished the afternoon hunt it will spread out its wings to help dry them before finding a suitable place to roost. 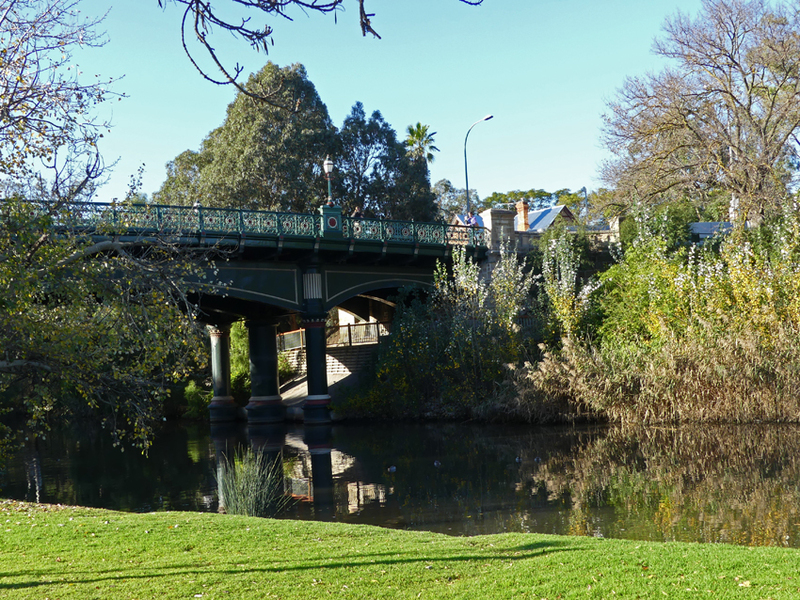 It is a mild winter afternoon and I am strolling around the Torrens Lake between the Frome Road Bridge and the new footbridge that links the city to the Adelaide oval. I have walked this circuit many times stopping at the zoo cafe for coffee, or dining at Jolley’s Boathouse Restaurant in the evening. 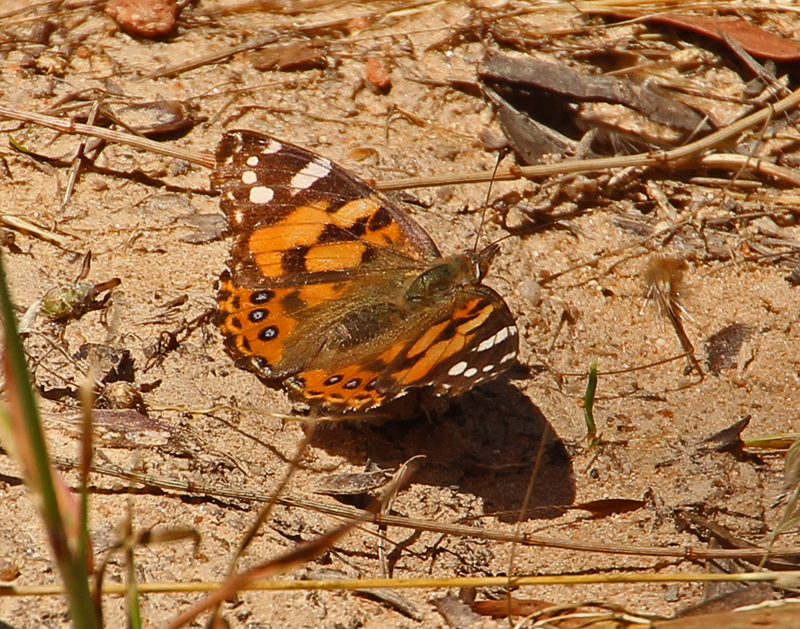 Each time I manage to encounter a different assortment of wildlife depending on the season, time and weather. 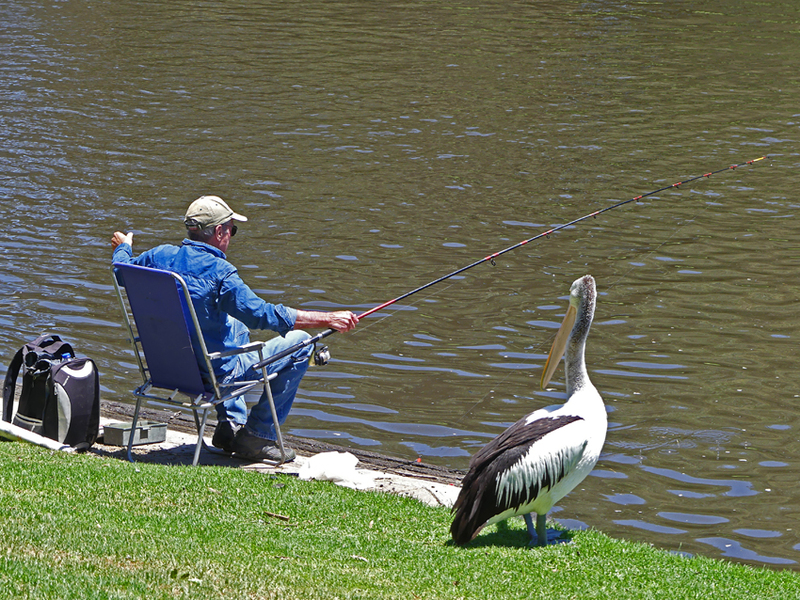 In front of Jolley’s a fisherman is casting for carp and earning the close attention of several Australian pelicans. One bird in particular is waiting to see if it can capitalise on his skills. Pelicans are common throughout the year. Sometimes they hunt individually catching small carp in their flexible, pouched beaks and at other times they work together to round up a school of fish. 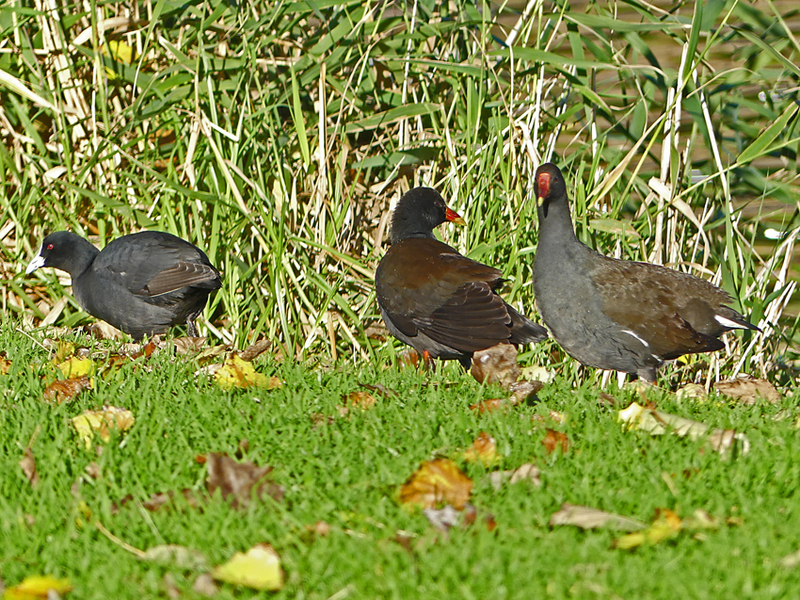 A little further along the embankment a pair of dusky moorhens and a Eurasian coot are feeding on the edge of the water. Coots are adept at diving and they are able to squeeze the water out of their feathers to decrease their buoyancy which makes foraging underwater easier. Both species tend to stay close to the reeds which provide both shelter and a safe place for nesting. While I am watching this little group I notice the characteristic V shaped ripples of an Australian water rat heading towards the far bank. 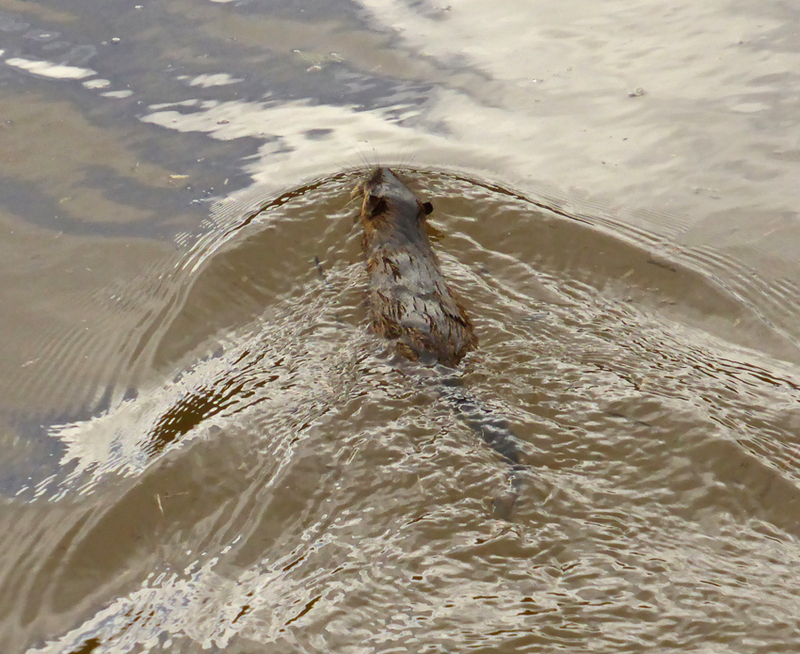 Water rats are shy and hard to photograph in the wild and I am pleased to fire off one or two quick frames before it disappears into a tangle of undergrowth and reeds. 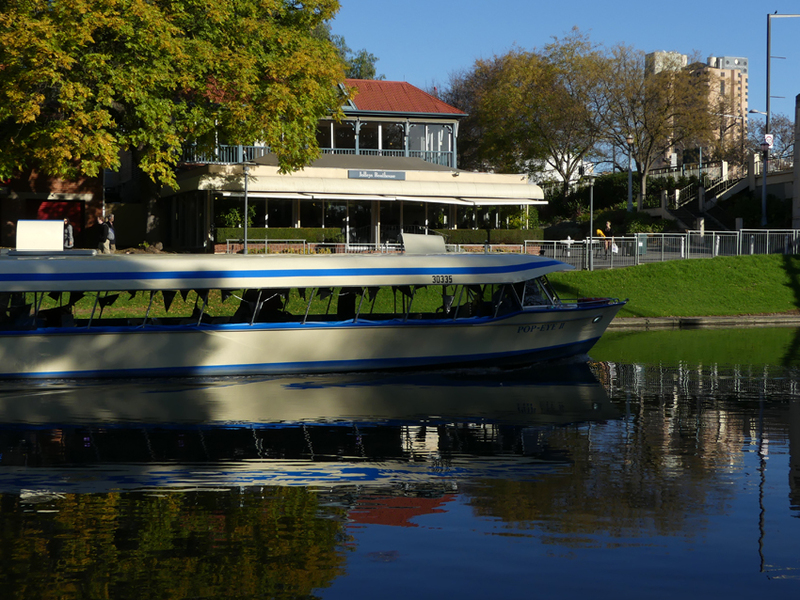 I cross over the Adelaide Oval footbridge to the northern side of the Torrens enjoying an uninterrupted view of the water, parklands and riverside buildings including the Convention Centre and Festival Theatre. A young family are manoeuvring their paddle boat near the fountains and black cormorants are drying their wings on the ‘paper-boat’ sculptures in the centre of the lake. Near the Frome Road Bridge several swans are swimming majestically along the edge of the manicured lawns to the delight of some children cycling along the path with their parents. The birds are very large with a wingspan approaching two metres and they can be quite formidable when there are cygnets around. 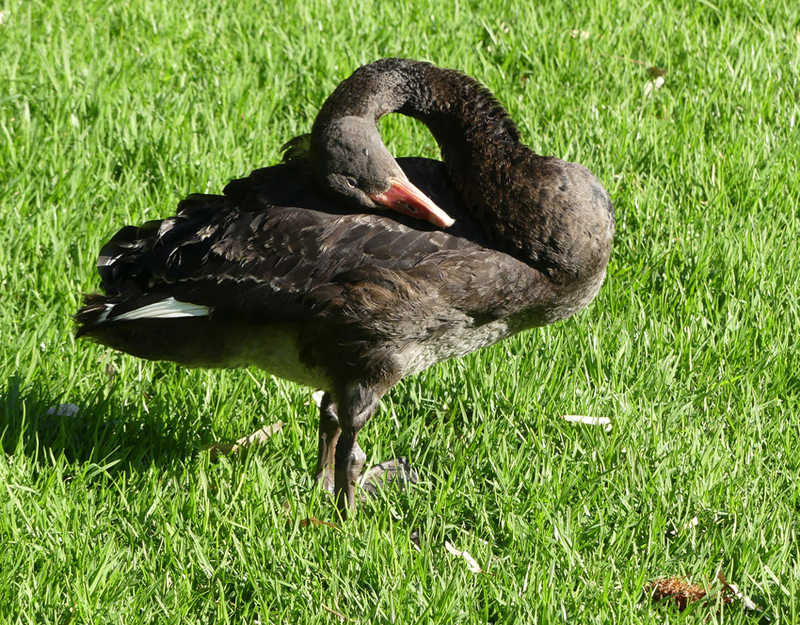 On the bank, another bird is using its long flexible neck to preen the feathers on its back and side. My walk concludes by the Frome Road Bridge where I indulge in a well earned cup of coffee at the Wisteria Cafe. Providing a wide range of snacks and casual meals, the cafe can be accessed from both inside and outside the zoo at the southern end of the bridge. 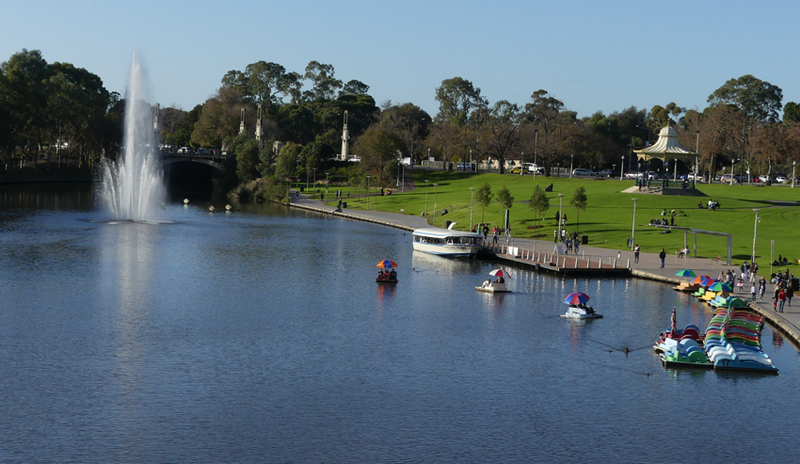 It provides a lovely parkland setting alongside a small creek that runs through the Botanic Gardens and into the lake.